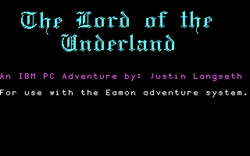 Lord of the Underland is an Eamon adventure written by Justin Langseth for the PC. Lord of the Underland was entered into PC-SIG's 1987 "Write an Adventure Module Contest" and the third original adventure for Jon Walker's MS-DOS port of Eamon. Its only competition was Matt Ashcraft and Richard Tonsing's Cronum's Castle, to which Lord of the Underland lost. Neither Lord of the Underland nor Cronum's Castle appeared to receive much marketing from PC-SIG. Indeed, the only subsequent mention by PC-SIG of this adventure mistakenly refers to it as "Lords of the Underworld" and describes it as "unsupported." You must fight your way through "the Underworld," [sic] taking on many foes in order to realize the object of your quest--a powerful sword. What appears to be the "powerful sword" mentioned above—the "Sword of the Underland"—actually rests unhidden and undefended on a trail long before the player reaches the "Underland." The antagonist—the eponymous "Lord of the Underland"—is a magician alternately referred to as "Meham" or "Mehan," who the game suggests has the status of a deity in his realm. In addition to the seeming goal of discovering and slaying Mehan—who has set up his chambers in the basement of the home of a suburban, nuclear family—there is an implied side-quest of freeing and safely returning Hugo and Lovely Linda, two captives taken from the Main Hall, who are being guarded by the dreaded "Pedso Man." The "Underland" lies beneath a mountain north of the Main Hall; the unnamed settlement within which Mehan has set up his lair lies north of this mountain. Lovely Linda may be the same character as Lovable Linda, an unusually charismatic Adventurer mentioned in The Eamon players manual. Windows, OSX, and Linux .zip folders containing Frank Black's PC Eamon Museum with a playable build of The Lord of the Underland from eamonag.org. Folder containing the MS-DOS files from textfiles.com. UPP file containing PC-SIG's description from textfiles.com. This page was last edited on 29 August 2018, at 16:06.